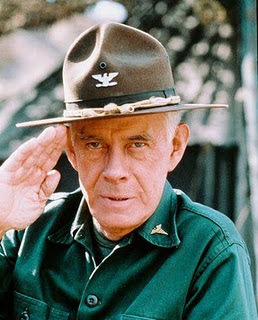 The sad news is coming out this afternoon that Harry Morgan, the already prolific actor before finding eternal fame on two of television's most classic series - as Bill Gannon on Dragnet and then Col. Sherman Potter on M*A*S*H - has passed away at the age of 96. This guy shined in everything that he was in, during a career that stretched all the way back to 1942. The following year he appeared in The Ox-Bow Incident, quite a controversial film for its time. Morgan followed that up with roles in The Glenn Miller Story and Inherit the Wind. In 1962's How the West Was Won he played General Ulysses Grant. And those were just a few of movies that Morgan appeared in (along with quite a few comedies). It was a Bill Gannon, alongside Jack Webb in Dragnet, that would have most cemented Morgan's place in entertainment history. But then he did Col. Potter in M*A*S*H: a role for which he earned an Emmy. And yeah I grew up watching M*A*S*H and I liked Hawkeye and Klinger and the rest... but for some reason Potter was even more the heart and soul of that show. A model Army officer and field surgeon, but with crack wit and profound wisdom. Not to mention some of the best lines of the entire show: "Horse feathers!" etc. And I also remember him in that series of "Incident" television movies that he made with Walter Matthau. Rest in peace, Mr. Morgan. And thanks for the many years of good drama and great laughs.